South Africa has been plagued by numerous planned and unplanned power outages as the existing power stations struggle to cope with reduced capacity. The completion of the Kusile Power Station will therefore have a significant impact on reducing the current load on the country’s power generation infrastructure. Once fully completed and online, expected in 2021, Kusile Power Station’s six units will generate 4800 MW. Situated in the Nkangala district of Mpumalanga, this coal-fired power plant will be the fourth-largest coal-fired power station in the world. The Kusile project will include a power station precinct, power station buildings, administrative buildings (control buildings and buildings for medical and security purposes), roads and a high-voltage yard. The associated infrastructure will include a coal stockyard, coal and ash conveyors, water-supply pipelines, temporary electricity supply during construction, water and wastewater treatment facilities, ash disposal systems, a railway line, limestone offloading facilities, access roads (including haul roads) and dams for water storage, as well as a railway siding and/or a railway line for the transportation of the limestone supply. Unit 1 was connected in December 2016 and is expected to reach full load in March 2018. This landmark event means that pedestrian traffic into the power station has increased significantly as the labour force expands accordingly. With an estimated operational life of 60 years and given its contribution to the national grid, protection of the power station is paramount. 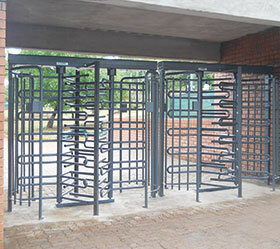 Craig Sacks, MD of Turnstar, says that the company was approached to provide 22 Triumph full-height double turnstiles to enhance security levels at the plant. Turnstar’s full-height industrial turnstiles are the appropriate fit for Kusile as they are the biggest selling turnstile in Africa, providing security of premises within the mining industry, as well as in factories, warehouses and busy stadiums. The Triumph turnstiles supplied to Kusile have been powder coated and fitted with brackets to house biometric readers, thereby enhancing the level of security provided. Powder coating is not only aesthetically pleasing but furthermore provided superior resistance to cracking, peeling, and chipping and offers abrasion-, corrosion- and chemical-resistance.